The purpose of Evolution and Us is to explore the human experience through the lens of evolution. Evolution is a fascinating subject to study, question, and discuss. As a field of inquiry it intersects most every scientific discipline— from biology and gene theory to psychology and sociology; from geology and geography to paleontology and anthropology; and from ecology and environmentalism to astrophysics. But, evolution is more than just something to help scientists understand the world around us. Evolution provides a plausible story line for the emergence of Homo sapiens as the world’s most intelligent and most impactful living species. Additionally, evolution can help us gain an understanding of who we are. Why we think the things we think. Why we do the things we do. Why we look like, smell like, sound like, feel like, and taste like the strange, bipedal apes that we are. The world can be a mystifying place and, as Homo sapiens, we are uniquely empowered to consider the strangeness of it all. Luckily, evolution provides a window through which to view the world around us and our relationship with that world. After all, we live in an ecosystem (or lots of ecosystems) that evolved not just around us, but with us. The world as we know it wasn’t just here for us to claim, we grew up with it. It changed and we adapted to it. Evolution provides the key to understanding it all. It is through the principles of evolution that we find an understanding of who we are. If you’re looking for absolute answers about the self, the Universe, or the meaning of everything there are plenty of people willing to provide those answers. The problem is that their answers often lack convincing substance or, said another way, they lack substantial evidence (or lasting results). The people providing these answers often do so at the behest of their own agendas, even if they are unaware of them. On the other hand, evolution does not purport to answer everything or anything at all. Evolution lacks consciousness, awareness, self will, and a desire to please. Evolution is just a mechanism. Defined simply, evolution is the process by which heritable characteristics change within biological populations over successive generations — or evolution is Descent with Modification. Though it is powerful, evolution has no agenda. The study of evolution and the application of the principles of evolution to our lives can be powerful and empowering. Syndey Harris, a journalist for the Chicago Daily News during the 20th Century, summed up my intentions for Evolution and Us well. I hope that Evolution and Us will allow me to be a window in a world of so many mirrors. This is not to say that I know everything or will ever pretend to know everything. For a view into my short comings and self-doubts, please refer to my disclaimer. 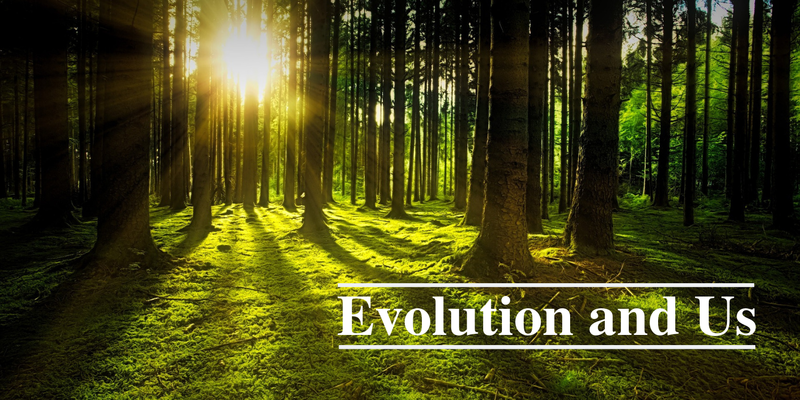 Everything we know about evolution comes from the scientific study of specific questions related to biology, psychology, anthropology, paleontology, geology, or other related fields. Many questions still abound, but the results flowing from the body of scientific research is both convincing and exhilarating. When following the scientific method, a scientist will create a hypothesis, devise a set of experiments to test the hypothesis, run those tests, and based on the results determine the strength of their original hypothesis. A scientist acting in good faith will work to disprove their hypothesis through as many reasonable experiments as they can conceive. Thus, with each successive experiment the hypothesis either breaks down or reveals itself as a convincing theory. It is this rigor to disprove that gives evolutionary science its credibility. A very good definition of science, in the context of this publication, comes from the renowned geographer Jared Diamond. In his book Collapse, Diamond defines science as “the acquisition of reliable knowledge about the world”. Examining this “reliable knowledge about the world” and our place in it, is what Evolution and Us is all about. In this publication, I take a look at what makes us human, what sets us apart from other species, and how we fit in this world we call home. And, I will do all of this through the lens of evolutionary theory. I know that evolutionary apologists have defended the term “scientific theory” at nausea. But, just so we don’t get confused — A scientific theory is a well-substantiated explanation of some aspect of the natural world, based on a body of facts that have been repeatedly confirmed through observation and experiment. Such fact-supported theories are not “guesses” but reliable accounts of the real world. I only point this out so that we do not confuse the term theory with the common vernacular, which is in reality referring to a hypothesis. I truly want Evolution and Us to help you gain an understanding of the principles of evolution and an appreciation of how these principles can affect your life. Additionally, I hope that I can be guided by my readers to produce evolution related topics that are of interest to you. If you have a question related to your life experiences and would like to explore it through the lens of evolution please let me know. You can find my contact info here, or connect with my personal account on Twitter — @explorer_poet. Or, if you have a topic you’d like me to write on, please add it to the comments below.